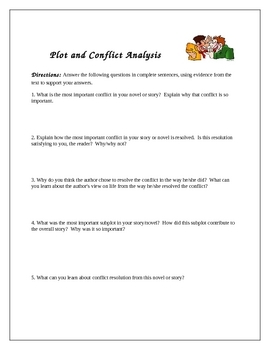 This document contains 4 different graphic organizers dealing with plot/conflict. It also includes a 6-option choice menu focused on characterization. 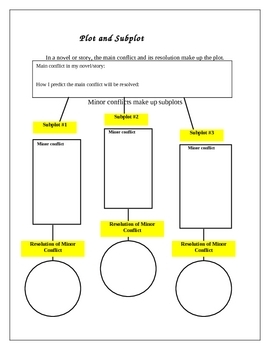 Each graphic organizer asks students to analyze conflict as it relates to the plot of a story. 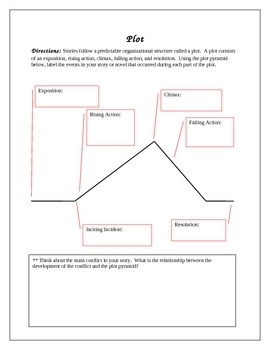 However, they each have their own unique focus: one is a traditional plot pyramid graphic organizer; another is a subplot analyzer; another is a conflict grid; and another is simply a series of questions. 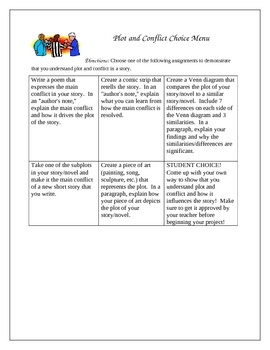 The choice menu focuses on multiple intelligences, giving students creative writing, drawing, and fine arts options to show that they understand the concept of plot/conflict.